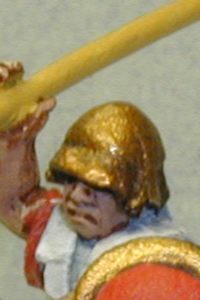 This isn't going to be a very in-depth or detailed look at Greecian helmet styles or cataloging attempts, rather a general sized overview (generalized from someone who provided a somewhat generalized overview anyway). Most of this classification comes from Greece & Rome at War by Peter Connolly. He basically gives a few broad categories of helmet: Chalcidian, Corinthian, Illrian, and Thracian. The names are not meant to imply a geographic origin for the helms, however. 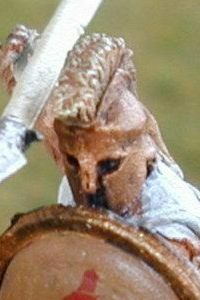 All of the following helmet types evolve from one of two models - either Illrian or Corinthian. 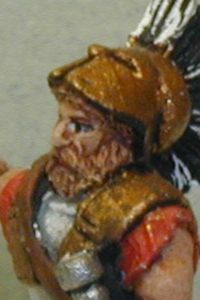 Add to that two more types you commonly see on miniatures - Attic and Boeotian. 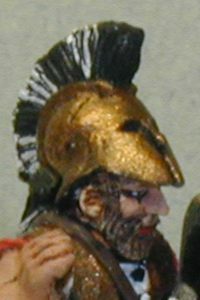 A good shot of a boeotian style helmet - this particular model being a Macedonain Companion from the Foundry's Alexandrian line sculpted by Steve Saleh. But it shows pretty much all the attributes of a boeotian helmet - looks a little like the Attic above except the amount of material beneath the flange is much greater and bent into four round corners. Althoug this particular model has an extra bit of material to make a more interesting looking bill on the front. 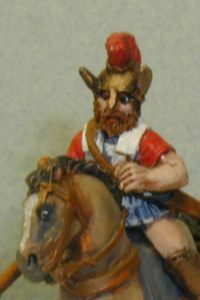 A Foundry cavalryman from the old range of D.G again - a perfect specimen for our helmet exam. Some modern comentators claim the boeotian helmet was made from felt - and not metal at all. Thus I felt sufficiently inspired to try my hand at painting one. This taught me I don't have the first clue how "felt" should look at this scale. So I have not tried any more since then. But here is to tipping my boeotian cap to those acedemics ... despite I feel they smoked a little bad weed. A chalcidian helmet is a descendant of the Corinthian helmet. Over time the Corinthian helmet grew and adapted, but hearing was always a problem. Enter the Chalcidian - a Corinthian helmet with the rear neck protection, cheek protection, but exposed ears. That is really about the best of a definition I am going to give to seperate the two. These first began to appear in the 6th century. 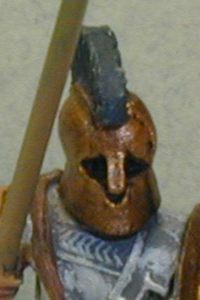 A very characterestic chalcidian helmet from the old Foundry greek line of Dave Gallagher. (Face it, Dave made some simply fantastic models.) 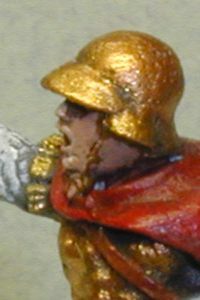 Notice the high raised loop for the ear - this is essentially what seperates a Chalcidian helmet from its Corinthian predecessor. 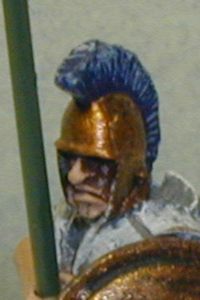 Another later Chalcidian helmet from the Foundry's new World of the Greeks like, sculpted by Steve Saleh. Note the ornimentation above the eye sockets. Later chalcidian helmets could have their cheek flaps attached on hinges. These flaps could then be raised when not necessary for added comfort. Go read Hanson's Western Way of War for a better description of just how uncomfortable all this panoloply could be - anything to help would have been greatly appreciated. 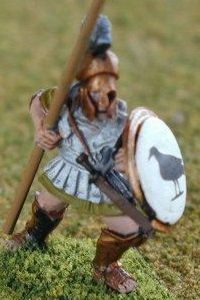 The model is a mounted hoplite (now treated as a general) from Foundry's old Gallagher range of greeks. 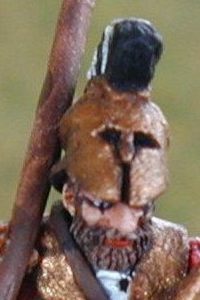 A chalcidian helmet on an Essex model. 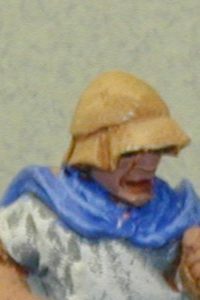 This model highlights another characterestic of a chalcidian helmet, the amount of face exposed with a chalcidian helmet is drastically greater than the corinthian helmets. The pride and joy of my photo collection - a REAL helmet shot. This little gem is owned by the St. Louis Art Museum. Some day I'll bribe the curator to let me try it on. The flip side is incredibly worn away, so that ain't likely. One thing that struck me was just how thin the bronze actually was. One would be lucky if it were as thick as a piece of card - I cannot imagine how it managed to stop anything other than a glancing blow. Physics alone would watch a 10 pound spear & metal tip, with a good 40 pound thrust behind it, dictates this will split easily. The white eyes are actually implanted stones. Now why can't a miniature manufacturer put one of these on a figure? 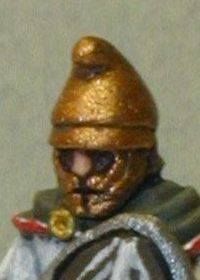 One of the two basic helmet types - the Corinthian helmet differs from its sister, the Illrian, because it offers nasal protection. The protection is great, from near the base of the neck all the way to the top. Corintian helmets were made from a single piece of bronze. The eye holes and mouth slit grew over time, allowing for better perception and communication. One of the drawbacks to this helmet is it lacks any ability to hear. 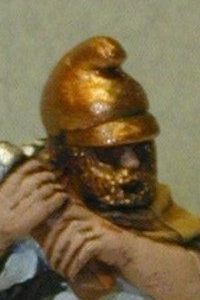 Various holing techniques were attempted, but eventually the chalcidian helmet evolved to suit the needs of the hearing enabled. A classic example of a corinthian helmet - protection from one cheek, around the back of the neck, and continuous to the next cheeck. 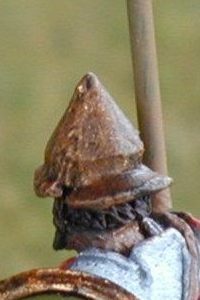 The bronze was somewhat thin and flexible - the cheeck pieces would actually flex slightly to facilitate sliding the helm down over the head and then flex back into place to help hold it secure. The model is a marching hoplite with his spear slung over his shoulder from the Foundry's old greek collection by Gallagher. This has to be the most unique of the old poses. The spear was removed for the photo. 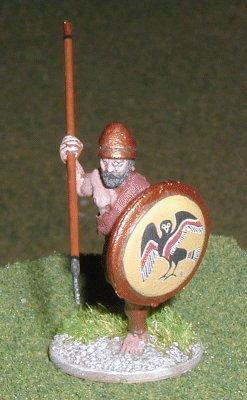 Another standing at ease hoplite from the old Gallagher collection. This model has a much more pronounced flange where the lip of the bronze sits beneath the skull for extra stability. But man, if you had a few good bruises on the head after the battle this must really hurt to try and take off. Front view of a corinthian helmet from the old Gallegher collection. This shot better illustrates the classic look for the eye sockets, and the narrow slit for the mouth and breathing. Another shot of the first model in this section, only from the front (and before I removed the spear). At this point I am just showing pretty models. 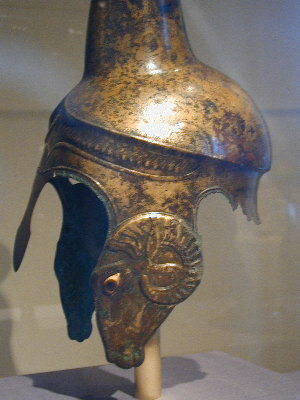 An earlier corinthian helmet with a high plume, this time from 1st Corps. 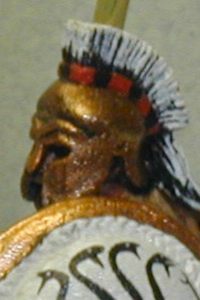 An italio-corinthian helmet on an Old Glory hoplite model. In Italy, as the rest of the world was evolving to help improve sight, sound, and breathing through their helmet, it became en vogue to try and suffocate. Or something like that, the hole for the nose & mouth disappeared and the eye slits gradually grew smaller. I can only imagine why the extra face protection was warranted. Either way I tip my hat to Old Glory as this is the only example I was able to find. The Illrian helmet is the other core helmet type, traced back to an old Mycenian design. 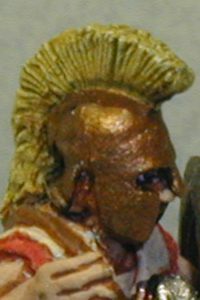 The stereotype of an Illrian helmet is cheek protection with no nose guard, typically in a nice large square shape like exhibited on this Old Glory model. Ear holes, which are not readily apparent in this photograph, similar to that seen on a Chalcidian helmet eventually evolved. Early Illrian helmets were actually forged from two pieces of bronze, riveted in a ridge across the top. The pylos helmet was cheap and easy to mass produce - as such it was frequently found in the less wealthy citizens who were happy to have anything better than a straw hat. The hat itself is somewhat self descriptive. 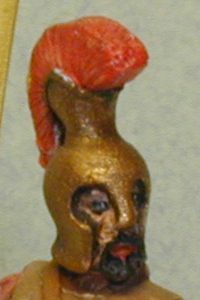 An old Foundry pylos helmet, sculpted by Dave Gallagher long ago (before Mr Saleh left his mark). This is one of the unique poses of the old Foundry line - standing at ease with the shield resting on the ground. One side of the helmet pretty much looks like the rest on this model. Old Glory's impression of apparently the same style helmet, as seen from the back. 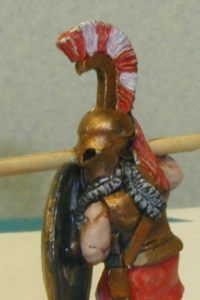 A Newline Designs hoplite wearing a pylos helmet. This is one of Sean's more elegant models. 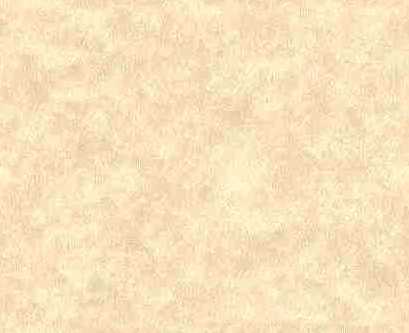 Connolly also lists a Thracian style, but he doesn't really talk much about it. Nor does he say it actually descends from either of the other two root styles. A Newline Designs hellenestic thracian with, wait for it, a thracian helmet. 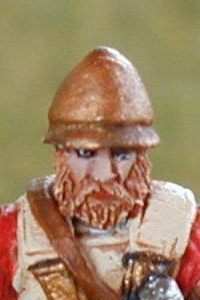 This is a little gem in the Newline collection, their thracian helm actually includes the embossed cheek and beard plates that didn't show too well in these photos. One distinct difference between this and the Corinthian derivitaves above is the nose sticking out - a large nosed man such as myself would certainly appreciate the room. Another Newline Designs hellenestic thracian with, wait for it, a thracian helmet. 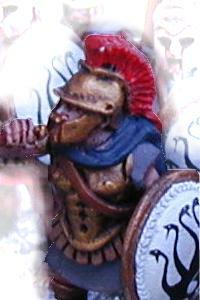 A new Foundry musician model wearing another style of "thracian" helmet.